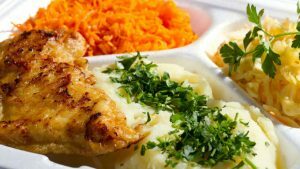 There are many factors that can influence your decision to subscribe to a meal delivery service. Pricing is usually highly ranked on the list of important features. However, is the cost of service really crucial when you’re deciding whether or not to order delicious, healthy food? 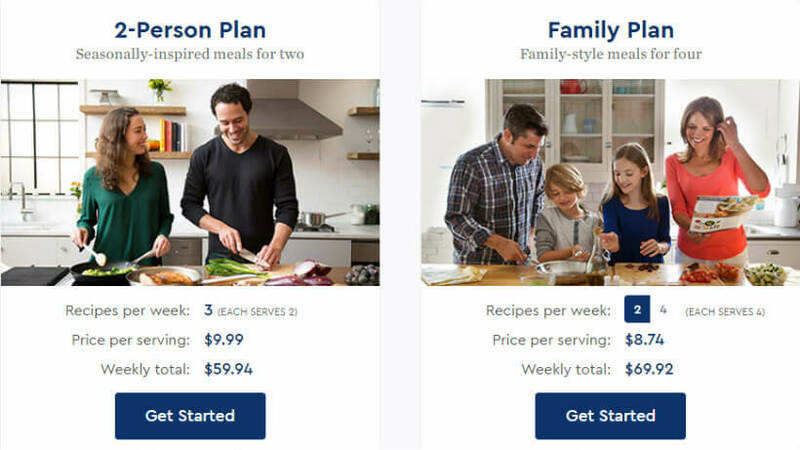 Let’s take a look at Blue Apron pricing so that you can find out if it is the best choice for you and your family budget. Blue Apron offers 4 different meal plans. These include 2-Serving Signature for omnivorous couples, 2-Serving Vegetarian for veggie lovers, 2-Serving WW Freestyle, developed in cooperation with WW – Weight Watchers reimagined, and 4-Serving Signature for omnivorous families. All 2-serving meal plans cost the same while meal kits available with the 4-serving plan come at somewhat lower prices. We will explore the costs with both meal plan types separately and see how much your weekly deliveries cost depending on how many people you cook for and how many meal kits you order per week. With 2-serving plans, you can order 2 or 3 recipes per week, each serving 2 people. The price per serving is always $9.99, regardless of the plan you choose (Signature, Vegetarian or WW Freestyle) and the number of recipes you order (2 or 3). Thus, if you order 2 recipes per week, your weekly order costs $39.96 (shipping not included). If you order 3 recipes, you pay $59.94 per week. The 4-Serving Signature plan works a bit differently. Not only does it cost less than 2-serving plans, but it also lets you enjoy lower prices if you order more recipes per week. If you order 2 Blue Apron recipes for 4 people, you pay $8.99 per serving. With 3 recipes for 4 people, you pay $7.99 per serving. Finally, the 4-recipe option allows you to cook amazing meals for your family at the price of just $7.49 per serving. That means that if you are cooking for 4 people, your weekly delivery costs $71.92 if you order 2 recipes, $95.88 if you order 3 recipes, and $119.84 if you order 4 recipes per week. With Blue Apron, you only pay for shipping if you order 2 recipes for 2 people. For such deliveries, shipping costs amount to $7.99 per delivery. For all other orders, shipping is absolutely free, no matter where in the continental US you live. Blue Apron provides nationwide coverage and delivers to almost any address in the country, with the exception of Hawaii and Alaska addresses. As for skipping an order, you can do it whenever you wish. Of course, if you decide to cancel the order last minute and your shipment is already prepared, you’ll have to pay for it. But if you cancel your order in advance, six days to be precise, you don’t pay anything. There are no penalties and you can keep ordering from your account whenever you want. You get healthy, hormone- and antibiotic-free ingredients delivered to your doorstep for the Blue Apron prices mentioned above. You can choose from various excellent recipes and get clear, simple instructions to prepare a delicious meal. You can adjust the recipes so that they follow your dietary needs. You can cancel or skip a week whenever you want without penalties. That sure sounds like a bargain. You know everything about Blue Apron pricing now, so check out our Blue Apron review to find out more about this excellent meal delivery service and place your order today!